The image of the original Japanese woodblock print by artist Toyohara Kunichika has been indexed by, and may be downloaded from, the Tsubouchi Memorial Theatre Museum, Waseda University; Artist: 国周, Item: 100-0629 (link). Panel 1 of 3 shows a long-haired person, possibly a woman, positioned behind a counter, with only its head and upper torso visible above the counter, wearing a black robe and black headgear. An easel nearby displays what appears to be a painting. A man stands facing this long-haired black-robed person and with his arm raised in the direction of the easel. Long-haired black-robed person: Counselor, why are you distracting the Court with ancient Japanese art? 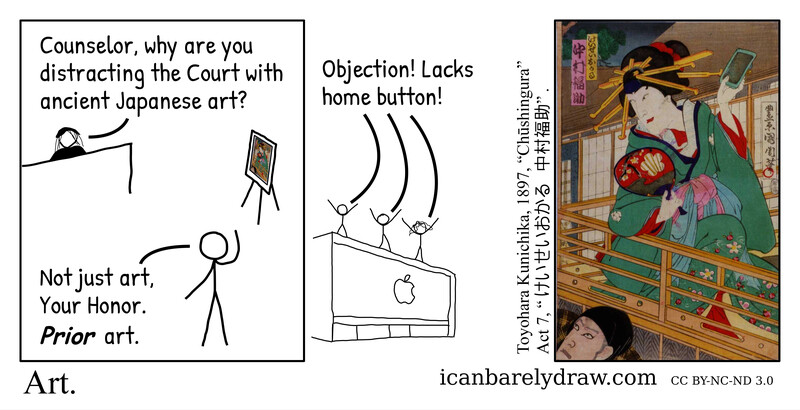 Man: Not just art, Your Honor. Prior art. Panel 2 shows two men and a woman standing on what might be the roof of a building. On the front wall of the building is drawn an apple with a bite taken out of its right side and with what could be a small piece of a stalk positioned above. All three together: Objection! Lacks home button!